Farol is a gorgeous Spanish Purebred gelding. 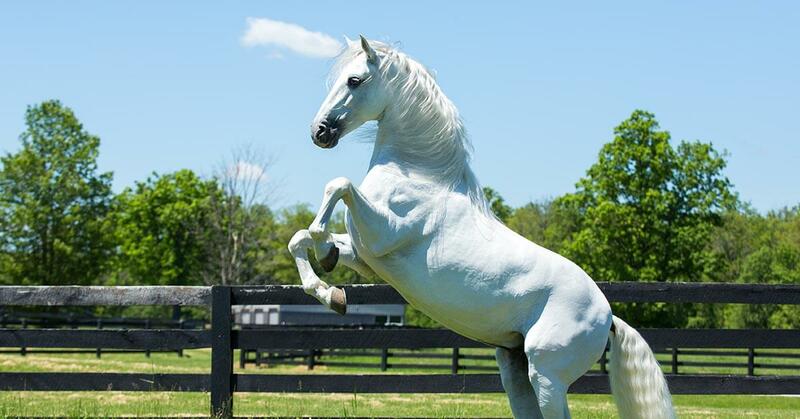 One of the 4-legged superstars of the Odysseo production, Farol is a gorgeous Spanish Purebred gelding. At 9-years-old, he is trained in both dressage and high school dressage. One of the stars that really stands out, Farol performs in both “The Travelers” and “The Great Adventure” as a solo dressage horse. That means instead of running with the team in the performances, he gets to strut his stuff in the spotlight! In the act, “The Great Adventure,” Farol really steals the show! He appears as a silhouette in front of a waterfall high above the hill in the distance. While other riders appear in front of the waterfall and make their way down to the giant 40,000-gallon lake, Farol demonstrates his mastery of piaffe and passage in the shadows, in perfect harmony with the Spanish-themed music. His refined and elegant movements add an element of mysticism to the performance. Farol then canters down to the lake with the others and takes his position in the centre. As the other horses ride through the lake, creating a splash, Farol keeps his composure and shows off his skills with pirouettes, piaffe and passage, Spanish walk and Spanish trot. Funny anecdote: when Farol started performing in “The Great Adventure”, he would be treated to an apple after each performance. One day, his then-rider Amélie decided to change his routine by offering him a banana… After just one bite, he spit it on the ground as if asking for an apple instead. Our horses are, without a doubt, the stars of the show. We pride ourselves on the way we take care of our horses here at Cavalia! We pamper them with treats, games and anything else we can think of to make their lives more enjoyable on and off the stage. We believe there is nothing too good for our stars! Farol is a very outgoing and social horse that loves being scratched all over: back, legs, head, face and even the tongue! He is very playful with the other horses and trainers. His groomer, Andréanne and his rider, Elise, understand exactly how to cater to this big cuddler and know all about his favourite scratching spots and preferred snacks. Don’t miss Farol and the rest of the stars of the Cavalia team on-stage in Odysseo!